March 2014: Ready, steady, Upload! 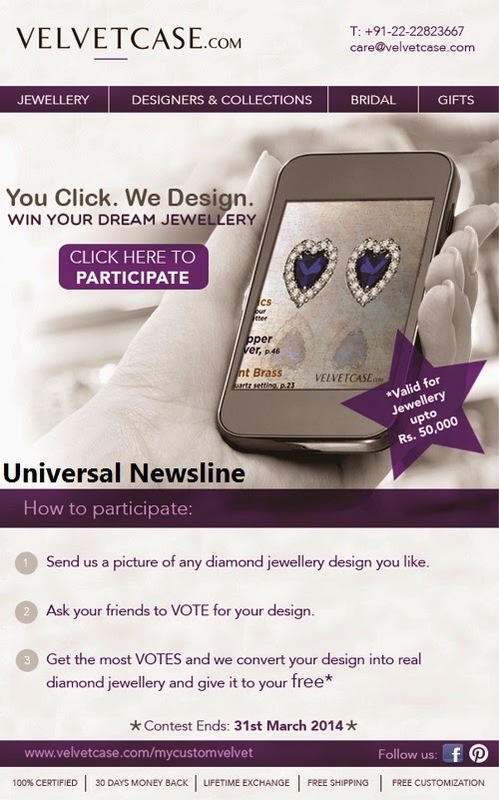 Velvetcase.com, India’s custom made online jewellery portal, introduces the “Win your Dream Jewellery” contest for diamond lovers. Velvetcase.com gives you a chance to win your favorite diamond jewellery piece by just entering into this simple online contest. The contestant with the maximum votes will win their dream diamond jewellery for free (upto Rs. 50,000). The First and the Second runner up will get vouchers from Velvetcase.com worth Rs. 10,000 and the seven other top designs get premium jewellery pouches worth Rs. 2,500. The Contest concludes on 31 March 2014, so gear up and start uploading now. Post the picture now and tell your friends, family and partner to jump on to ‘like’ your design to increase your votes. There will never be a better chance to get your favorite diamond piece for free! The winner will be determined by a final count of votes on April 2, 2014.